The Step Cut doesn't display especially good scintillation. 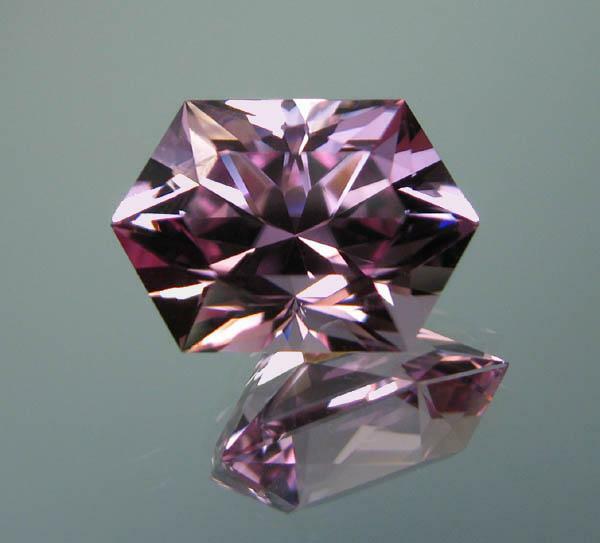 It is used to cut gem materials that have good clarity and fine color. 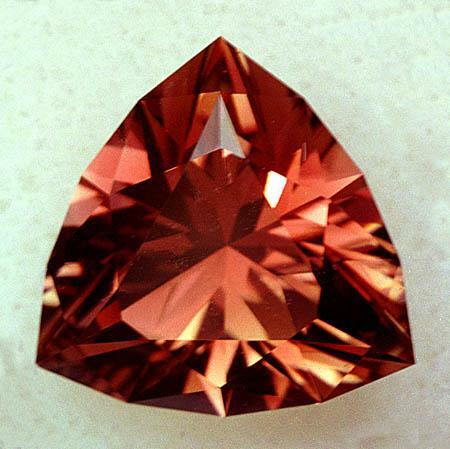 This gemstone has been heat-treated and shows an unusual slightly orangish-pink color. This stone would look beautiful in a a custom designed pendant or occasional-use ring. 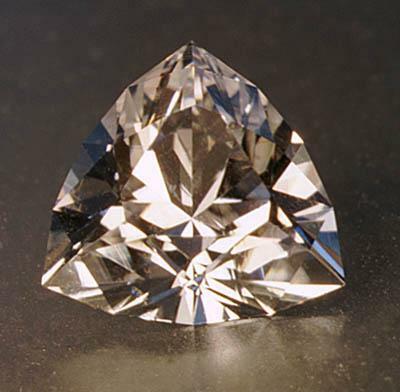 The facet design shown above is one of many created by Robert Long. 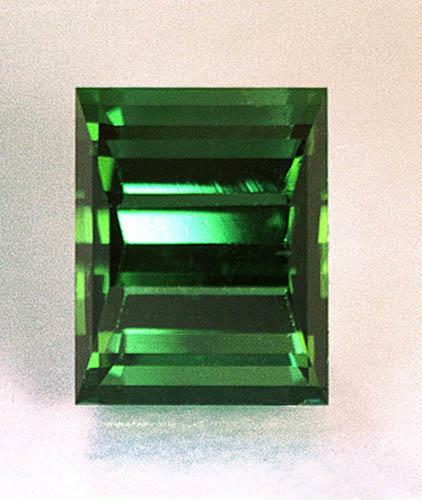 Unlike standard step cuts or emerald cuts, the above cut has angled pavilion facets that deliver a shifting pattern of light flashes as the gem is moved. 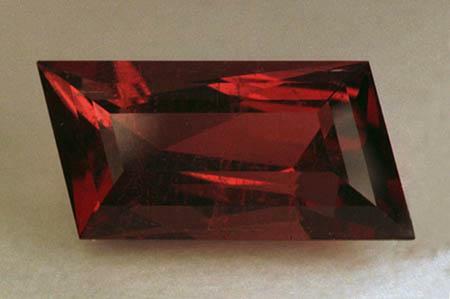 Also unusual about this gemstone is the fact that the ends of the gem are a deeper and more vivid raspberry red than is the center of the stone. 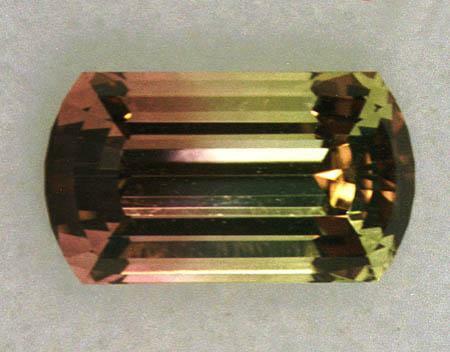 This is not a result of color zoning, but arises from the fact that the tourmaline crystal from which this gem was cut had a darker red color on the crystallographic C-axis than it did in other directions. This gemstone has not been treated in any fashion. This gem would look beautiful in an occasional-use ring, pendant, or pin. The Hexagonal Barion design is one of many excellent gemstone designs by Robert Long. This cut delivers very good light return and scintillation. 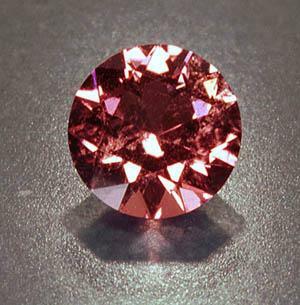 The color of this stone (Not subjected to any treatment) is a very pleasing rosy-pink. This gemstone would work well in a custom pendant or ring design. 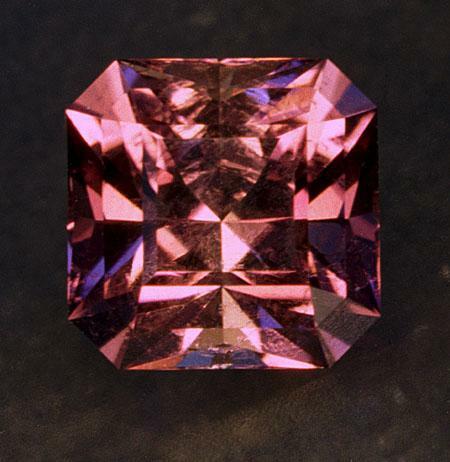 Shown above is an orangy-pink tourmaline that would look great in a pendant, pin, or special occasion ring. This stone is of very good clarity and exceptionally fine craftsmanship. The symmetry, polish, facet meets and optical performance are outstanding. This gem has not been heat treated. Achroite, the name given to colorless tourmaline, is rarely found in nature. Shown above is an expertly crafted tourmaline that is the result of a happy accident. I had finished cutting a nice piece of pink Nigerian tourmaline and wished to lighten its color slightly by heat treatment. Not paying careful attention to the temperature and time, this stone was heated until it lost all color; "voila"; achroite! This stone is of very good clarity and exceptionally fine craftsmanship. The symmetry, polish, facet meets and optical performance are outstanding. If you are a gemmologist, or gem connoisseur, here is a great stone for your collection. Certainly your friends will never be able to identify it by color, or lack thereof. If you just wish an unusual stone for a pendant or pin, this stone would be perfectly suited. 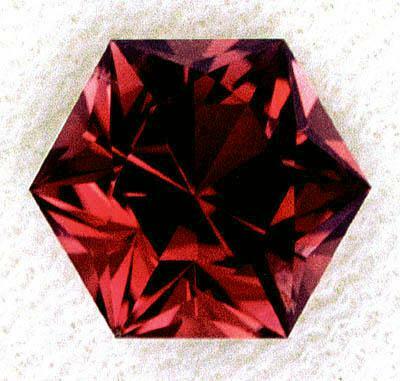 Shown above is a gorgeous, very slightly purplish-red rubellite tourmaline of excellent clarity. This gemstone is a well crafted native-cut stone of good proportion and finish. This gem would look beautiful as the center stone in a pendant, pin, or ring. Presented here is a nicely color-matched suite of round-cut pink tourmalines. Use them as accent stones in a custom ring, pendent, or earring design. 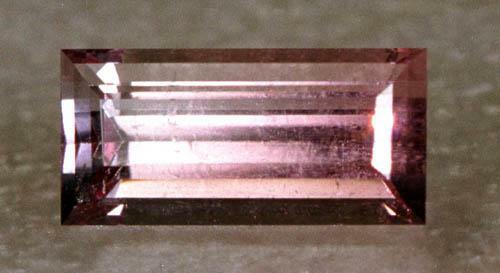 Shown above is an attractive slightly purplish-pink tourmaline of excellent clarity. 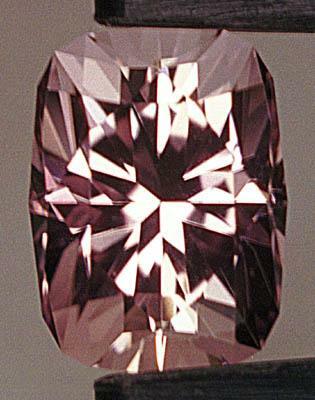 The body color of this gem is actually a uniform purplish-pink (overexposure caused by bright light flash has resulted in white areas in the above image). The Pulsar Cut, a design by Bruce Harding, delivers good light return and scintillation. This is an expertly crafted gemstone; the facet meets, symmetry, and polish are all excellent. This gem would look beautiful as the center stone in a large pendant, or other piece of jewelry. Except for the expert faceting, the gem rough for this stone, and the stone itself, have not been enhanced in any way. 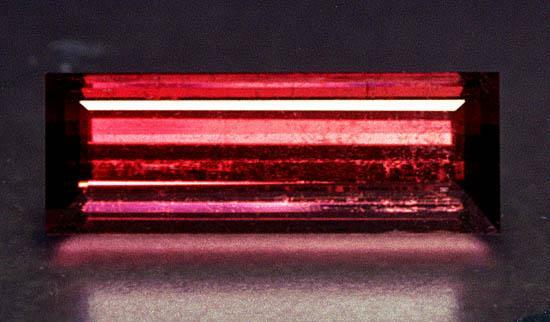 Shown above is a beautiful, slightly purplish-red, rubelite tourmaline of good clarity. This is an expertly crafted gemstone; the facet meets, symmetry, and polish are all excellent. This gem would look beautiful as the center stone in a pendant, pin, or special occasion ring. 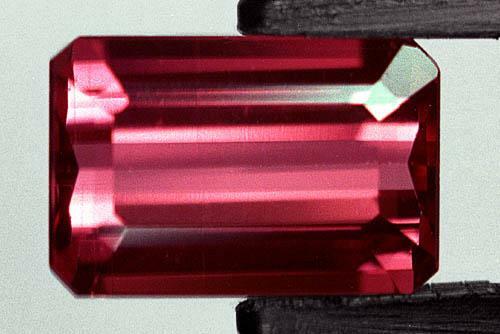 Shown above is an attractive rosy-pink tourmaline cut from Nigerian material. The facet design, a cut corner barion square, is by Sid Ward. This cut delivers excellent light return and scintillation. This is an expertly crafted gemstone; the facet meets, symmetry, and polish are all excellent. This gem would look beautiful as the center stone in a pendant, or other piece of jewelry. 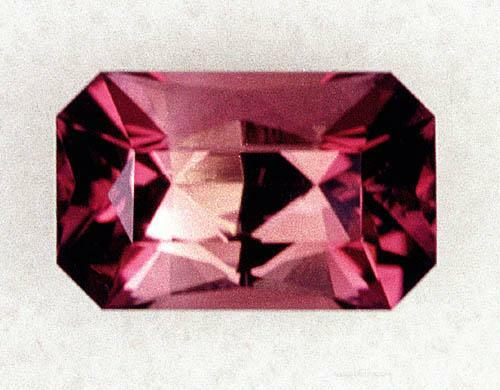 Shown above is a hot pink tourmaline cut from Nigerian material. The cut on this gem, a scissor brilliant hexagon designed by Sid Ward, delivers excellent scintillation and light return across the entire top of the gem. This is an expertly crafted gemstone; the facet meets, symmetry, and polish are all excellent. 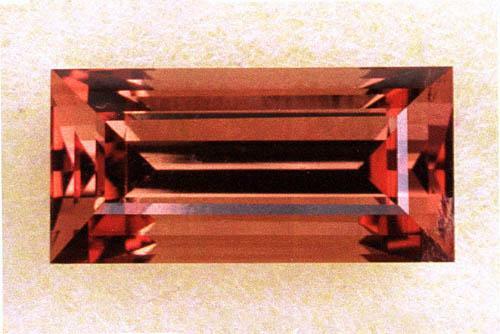 Although the above image shows facets appearing white (a result of overexposure during photography) the body color of the gem is pleasing uniform light pink. This gem would look great as the center stone in a pendant or pin. The stone would be too large for use in most ring designs. This stone was heated to lighten its color. Tourmaline occurs in a tremendous array of colors. 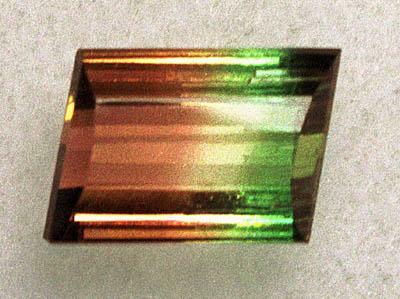 Sometimes, multiple colors occur in a single crystal. 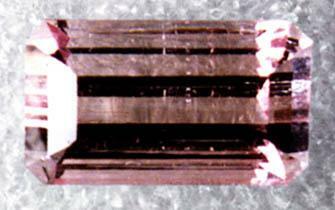 Shown above is an attractive gemstone cut from a crystal that contained pinkish, colorless, and greenish color zones. The above gem was cut from a tourmaline crystal from the Morro Rendondo mine in Minas Gerais, Brazil. This stone would make an unusual and very attractive pendant, pin, or ring. 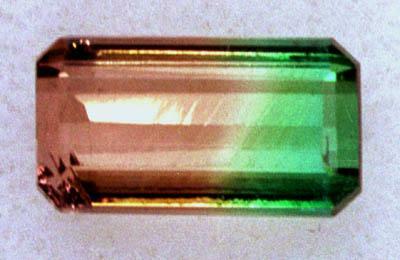 Shown above is a tourmaline displaying one of the less common colors for this gem material; a medium, slightly greenish-yellow. This gem would work well as the centerpiece in a small pendant. 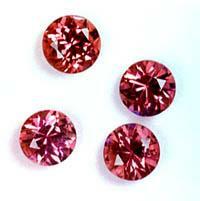 This is an attractive pink gem with slight color zoning (light to darker pink from left to right). This would be a nice center stone for a pendant. 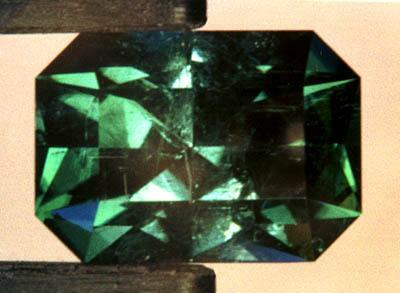 Shown above is an expertly crafted tourmaline of medium dark, very slightly bluish-green color. This well crafted, attractive, stone would look great in a pendant, pin, or special occasion ring. Shown above is a beautiful green tourmaline of expert craftsmanship. This custom cut maximizes the green color, but the stone will require a custom channel setting. To optimize the color of the gemstone, the side facets on the pavilion (bottom half of the gem) are cut at a steep angle. Both the top and bottom facets are long thin rectangular and parallel shapes, hence the name "Bar Cut." 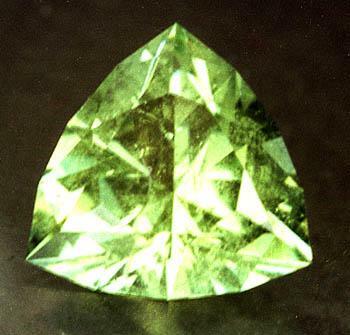 As the stone is moved these long thin facets deliver a pleasing series of green flashes. The Himalaya Mine in southern California is one of the world's premier tourmaline gem mines. For many years this prolific mine has produced lovely red, pink, green and blue tourmaline crystals. Those crystals that do not qualify for a museum or collection are the source of rough gem material that can be cut into gorgeous gemstones. Shown above is an expertly crafted bicolor tourmaline gem that would serve well in a custom designed ring, pendant, or pin. The above static image does not adequately represent the beauty of this untreated gem. The Himalaya Mine in southern California is one of the world's premier tourmaline gem mines. For many years this prolific mine has produced lovely red, pink, green and blue tourmaline crystals. Those crystals that do not qualify for a museum or collection are the source of rough gem material that can be cut into gorgeous gemstones. Although the highest clarity grade used by the Gemological Institute of America for colored gemstones is VVS (very very slightly included), the above gem is internally flawless (IF). This expertly crafted pink tourmaline gem would serve well in a custom designed ring, pendant, or pin. The above static image does not adequately represent the beauty of this untreated gem. 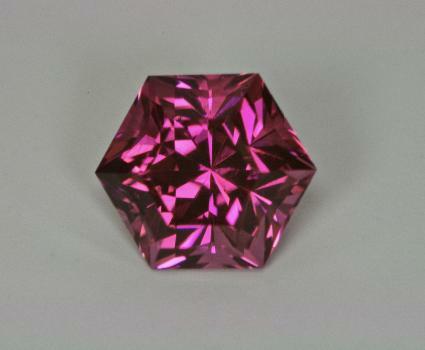 Shown above is a well crafted bright pink tourmaline from an unspecified African gemfield. This gem would work well as the centerpiece in a small pendant or occasional use ring. Shown above is an expertly crafted indicolite tourmaline of medium-dark, very slightly greenish blue color. The stone is of excellent clarity. This expertly crafted gemstone would look gorgeous in a pendant, pin, or special occasion ring. Yes, this is a true cuprian elbaite from the original Brazilian discovery of this very rare variety of tourmaline first mined by Heitor Dimas Barbosa. I purchased a small parcel of this material at one of the Tucson shows in early 1990 and cut the stone shortly after. 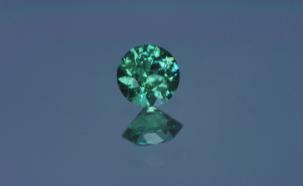 Note that Paraiba tourmaline is a GIA Type III gem material. The small amount of Paraiba tourmline mined in Brazil was usually heavily included. A Paraiba tourmaline graded VS will show some eye-visible inclusions. The gemstone shown above is small, but the color is the neon blue that dazzled the gemstone industry in the 1990's and still thrills collectors today. Much of the Brazilian Paraiba tourmaline came from the ground with a grayish color tone. Mild heating eliminates the undesirable gray, and leaves the electric blue and green color. This gemstone, like most Brazilian Paraiba tourmaline, has been heat treated. If you are interested in purchasing this gemstone I can arrange for a GIA certification, at modest cost, prior to the transaction. This little gem would be an absolutely gorgeous centerpiece in a pendant. Yes, this is a true cuprian elbaite from the original Brazilian discovery of this very rare variety of tourmaline first mined by Heitor Dimas Barbosa. I purchased a small parcel of this material at one of the Tucson shows in early 1990 and cut the stone shortly after. 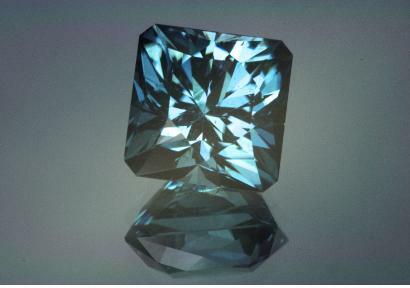 Note that Paraiba tourmaline is a GIA Type III gem material. The small amount of Paraiba tourmline mined in Brazil was usually heavily included. A Paraiba tourmaline graded VVS will show essentially no eye-visible inclusions. 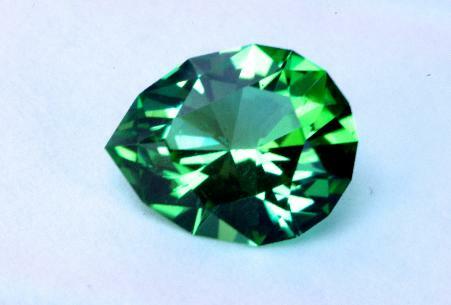 The gemstone shown above is small, but the color is a vibrant mint green. Much of the Brazilian Paraiba tourmaline came from the ground with a grayish color tone. Mild heating eliminates the undesirable gray, and leaves the electric blue and green color. This gemstone, like most Brazilian Paraiba tourmaline, has been heat treated. If you are interested in purchasing this gemstone I can arrange for a GIA certification, at modest cost, prior to the transaction. This little gem would be an absolutely gorgeous centerpiece in a pendant. Yes, this is a true cuprian elbaite from the original Brazilian discovery of this very rare variety of tourmaline first mined by Heitor Dimas Barbosa. I purchased a small parcel of this material at one of the Tucson shows in early 1990 and cut the stone shortly after. 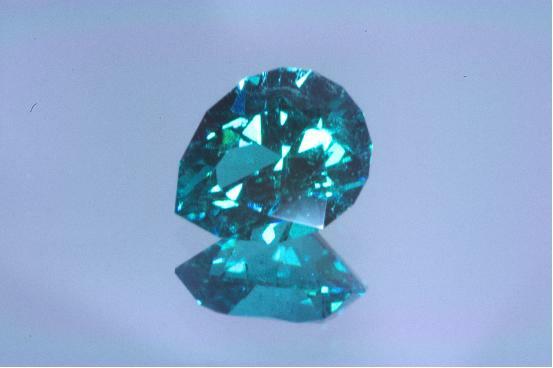 Note that Paraiba tourmaline is a GIA Type III gem material. The small amount of Paraiba tourmline mined in Brazil was usually heavily included. A Paraiba tourmaline graded VS will show essentially no eye-visible inclusions. The gemstone shown above is small, but the color is the vibrant mint green characteristic of fine Paraiba tourmaline. Much of the Brazilian Paraiba tourmaline came from the ground with a grayish color tone. Mild heating eliminates the undesirable gray, and leaves the electric blue and green color. This gemstone, like most Brazilian Paraiba tourmaline, has been heat treated. If you are interested in purchasing this gemstone I can arrange for a GIA certification, at modest cost, prior to the transaction. This little gem would be an absolutely gorgeous centerpiece in a pendant. Yes, this is a true cuprian elbaite from the original Brazilian discovery of this very rare variety of tourmaline first mined by Heitor Dimas Barbosa. I purchased a small parcel of this material at one of the Tucson shows in early 1990 and cut the stone shortly after. 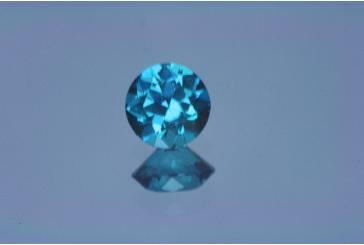 Note that Paraiba tourmaline is a GIA Type III gem material. The small amount of Paraiba tourmline mined in Brazil was usually heavily included. A Paraiba tourmaline graded VS will show essentially no eye-visible inclusions. 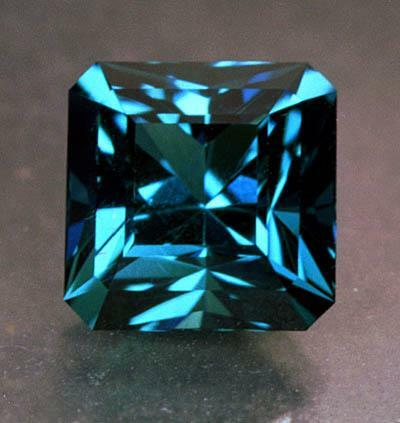 The gemstone shown above is small, but the color is the electric blue characteristic of the finest Praiba tourmaline. Much of the Brazilian Paraiba tourmaline came from the ground with a grayish color tone. Mild heating eliminates the undesirable gray, and leaves the electric blue and green color. This gemstone, like most Brazilian Paraiba tourmaline, has been heat treated. If you are interested in purchasing this gemstone I can arrange for a GIA certification, at modest cost, prior to the transaction. This little gem would be an absolutely gorgeous centerpiece in a pendant. 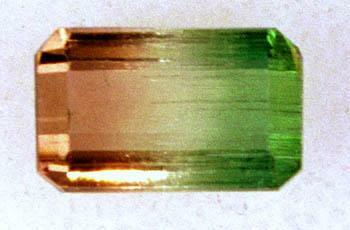 Nigeria has long been the source of variety of gem materials, including tourmaline. 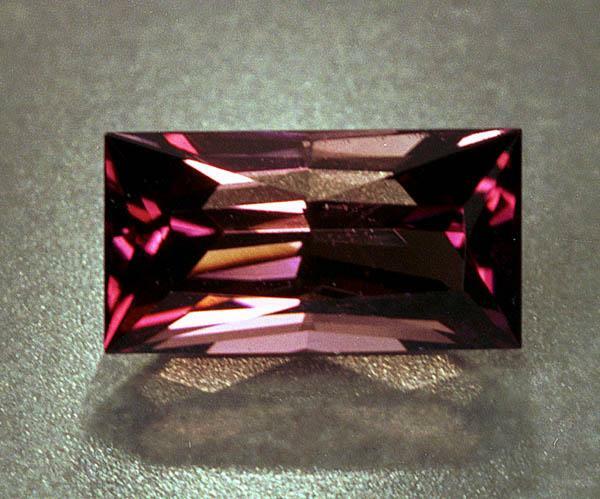 In the last 20 years there has been a large production of rough tourmaline of remarkable color and clarity. Besides the beautiful pink and red tourmaline, the Nigerian gemfields have also produced gorgeous green and blue crystals, and even some cuprian elbaite resembling the famous Paraiba tourmaline from Brazil. I faceted the above gemstone in 2005 from a tourmaline crystal section of deep sky blue color and excellent clarity. The cut is a combination of designs by Fred van Sant and Robert Long. The square brilliant cut delivers beautiful scintillation. This expertly crafted gemstone would look beautiful in a special occasion ring, pendant or pin.